Life in the outer realm is a lawless, dirty, hard existence, and Solara Brooks is hungry for it. Just out of the orphanage, she needs a fresh start in a place where nobody cares about the engine grease beneath her fingernails or the felony tattoos across her knuckles. She's so desperate to reach the realm that she's willing to indenture herself to Doran Spaulding, the rich and popular quarterback who made her life miserable all through high school, in exchange for passage abroad the space liner Zenith. I moved this one up on the blogging list because I enjoyed it so much :) Jessica at Bookplots & Polka Dots once told me that Regency fiction was her book jam...well, I think books with spaceships is mine :) Is "book jam" a thing? Not sure. But do you want to make it a thing with me? Cause I kinda like it. Solara is an orphan looking to build a life for herself. Doran is a rich boy who thinks he has everything figured out, including putting Solara in her place. But when the two end up on the Zenith flying to the outer realms, they realize that maybe life is what they make it, and what they really need is each other. 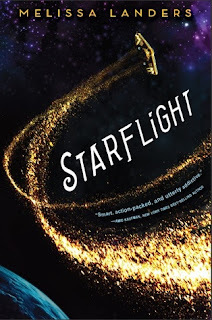 Just like Avalon by Mindee Arnett, Starflight reads like it would make a great TV show in the same world as Firefly. (Perhaps that's why I like spaceships so much...) Solara is determined and talented, a mechanic who wants something to call her own, even if living in the outer realms can be unpredictable. While she has found herself on the wrong side of the law a time or two, it's only for survival, which I don't condone but totally respect. She's a fighter, and I really liked her. Doran I didn't love so much at first. Sure, it wasn't hard to figure out what direction the book would eventually take, but I loved the ride. The gradual friendship between the two seemed genuine. It wasn't love at first sight, thank goodness, and there were no love triangles. Definitely a breath of fresh air. The twists and turns as the story progresses were spot on and believable. And they were on a spaceship with an awesome crew. And there were space pirates. And a harvest festival on a far off planet. And space pirates.